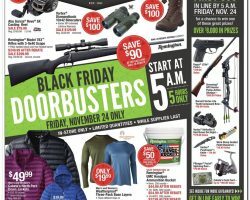 Cabela’s Black Friday Sales 2019. 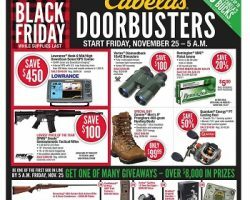 Find Cabela’s Black Friday ad, deals and sales for 2019 from blacknfriday.com. 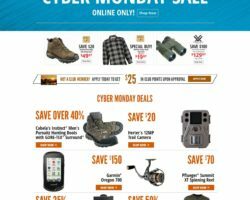 Cabela’s is a retail company in the U.S. that specializes in hunting gear and apparel, camping, fishing, boating and shooting. 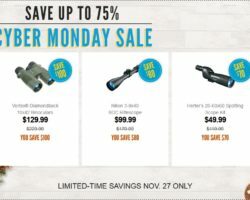 The retailer sells a good selection of top quality merchandise and features everyday convenient prices in addition to everyday deals. The company was founded in 1961 and has since evolved into a multi-channel retailer, nowadays selling online too and being one of the most successful retailers in the industry. 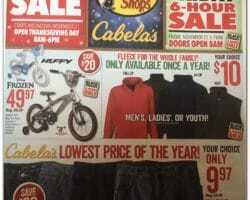 The retailer online store was ranked Number 1 in 2006 and the company also received the Company of the Year nomination that year in Sporting Classics magazine. 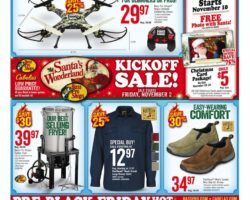 The retailer continues to operate as one of the most trusted retailers on the market, offering customers nationwide access to superior quality products and best deals. 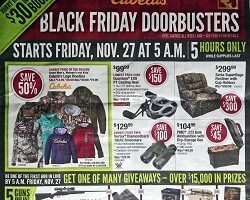 They carry various sales throughout the year, and last year the Cabela’s Black Friday Ad Sale offered many doorbusters and incredible savings on store brand hunting apparel, binoculars, sleeping bags, weatherproof base layers and hiking shoes to name just a few.